(Nanowerk News) The U.S. Department of Energy's (DOE) Brookhaven National Laboratory is constructing the world's most brilliant light source, the National Synchrotron Light Source II (NSLS-II). In a recent decision, DOE has approved a new project to begin conceptual design of NSLS-II experimental tools, named NEXT. 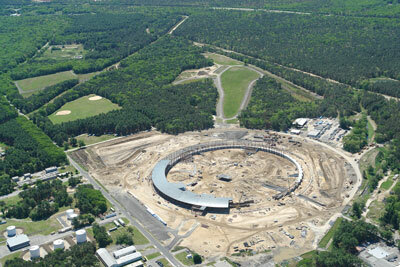 National Synchrotron Light Source II under construction. The research potential of NSLS-II will only be realized when it is equipped with scientific instruments known as beamlines. Specialized magnets called insertion devices will create the light used by the most advanced of these beamlines. The NSLS-II construction project is already building six beamlines with insertion devices. NEXT would support the creation of another five or six insertion device beamlines. NSLS-II will be capable of supporting some 58 beamlines in total. Additional beamlines for NSLS-II would be funded by various other sources over time. An insertion device beamline can range in cost from $10-15 million, depending on its design and components. Those requirements are determined by the particular experimental studies being done. "Much of the research at NSLS-II will focus on developing the next generation of sustainable energy technologies," said Steve Dierker, NSLS-II Project Director and Associate Laboratory Director for Light Sources at Brookhaven Lab. According to Dierker, these new technologies will be based on novel materials that have yet to be designed and fabricated. The NEXT project would provide beamlines with the advanced capabilities needed for studying the properties and functions of complex materials. "Most of today's technologies are built using bulk materials whose properties are not sufficient to enable next generation technologies," added Dierker. "Although we understand quite a lot about the properties of bulk materials, we have not yet succeeded at improving their properties by the amount needed for the new applications. The challenge is to work dramatically below the bulk state, in the range of single atoms to tens of atoms. The NEXT project can give NSLS-II the advanced tools to do that." As the world's most brilliant light source, NSLS-II will foster groundbreaking scientific advances. Brookhaven's currently operating light source, NSLS, draws each year about 2,200 researchers from 400 universities, government labs, and companies to study a wide range of materials, from catalysts, to computer chips, to biological molecules. To take their research to the next level — to probe even smaller, subtler details of their samples — scientists need more intense, better-focused light. NSLS-II will deliver world-leading intensity and brightness, producing x-rays 10,000 times brighter than the current NSLS. In fact, its x-ray brightness and resolution will exceed all other light sources, existing and under construction. This will enable the nanoscience revolution, giving scientists the ability to image materials down to a nanometer, one billionth of a meter — a capability not available at any other light source in the world. The unique characteristics of NSLS-II will help scientists explore the grand challenges they face in developing new materials with advanced properties. It will pave the way to discoveries in physics, chemistry, and biology — advances that will ultimately enhance national security and help drive the development of abundant, safe, and clean energy technologies. NSLS-II construction began in 2009, creating jobs and stimulating the economy. The facility is expected to start operating in 2015. NSLS-II is funded by the Department of Energy Office of Science, which is also supporting the NEXT project. Visit the website for more info about the NSLS-II project.